Mouth Watering Chocolates In A Crispy And Crunchy Hazelnut Exterior Are Individually Wrapped For That Freshness. The Smooth And Creamy Soft Milk Chocolate Piece Is Just Breath Taking For The Chocoholics! Gift This Pack Of Exclusive Ferrero Rocher Chocolate To Your Friends And Relatives! Ferrero Rocher Gift Box Set. A Delicious Gift Box Set Of Ferrero Rocher Candies. Each Individually Wrapped To Ensure Freshness. Crisp Hazelnut And Milkchocolate-Covered Specialty With A Smooth Feeling And Whole Hazelnut. 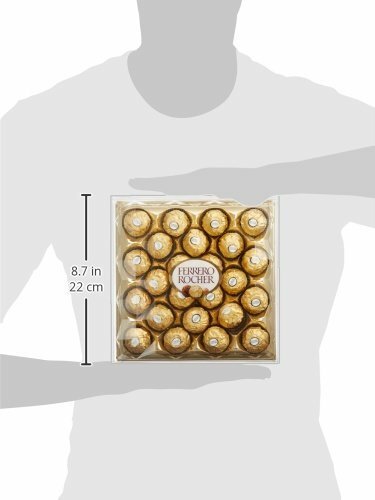 Ferrero Rocher Chocolates - 24 Pcs Pack (300 gms) Best selling Chocolates Content: 1 box of 24pieces Best Gift for Festivals, & someone you love Mouth Watering Chocolates In A Crispy And Crunchy Hazelnut Exterior Are Individually Wrapped For That Freshness. The Smooth And Creamy Soft Milk Chocolate Piece Is Just Breath Taking For The Chocoholics! Gift This Pack Of Exclusive Ferrero Rocher Chocolate To Your Friends And Relatives! Ferrero Rocher Gift Box Set. 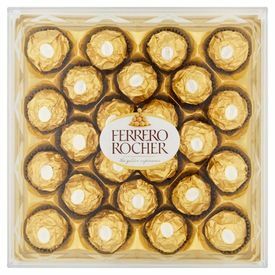 A Delicious Gift Box Set Of Ferrero Rocher Candies. Each Individually Wrapped To Ensure Freshness. Crisp Hazelnut And Milkchocolate-Covered Specialty With A Smooth Feeling And Whole Hazelnut. Amazing Tastes... Amazing delivery time... Thanks for the super fast delivery.